4: Stylish and durable for Aluminum alloy Enclosure. Easily cooling down when working . 5:Slim design . Easy to carry and Allowing you to expand your computers capabilities while on-the-go. 7: The ultra-thin Macbook hub provides you with 3 USB3.0 ports , 1 USB -C female power-through, 1 HDMI port , 1 SD and 1 Micro SD slot. UP TO 100W charging power. 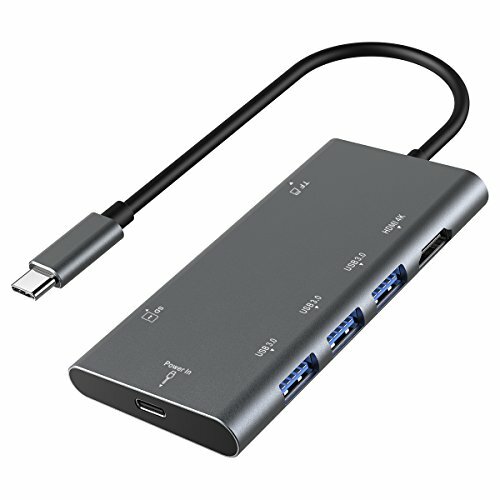 ► [4K Video Adapter] Mirror or extend your screen with HDMI port and directly stream 4K UHD (3840x2160@30Hz) or Full HD (1920 x 1080@ 60 Hz) video to HDTV, monitors, and projectors. ► [SUPERSPEED DATA SYNCING] 3*USB 3.0 ports allow data transfer rate of up to 5 Gbps, fast enough to transfer an HD movie in seconds. Built in SD and TF slots easily transfers files from SD/TF card to your devices at a speedy 5 Gbps. ► [Our Worry-Free Warranty] USB C HUB is backed with 12-Month product replacement Warranty and friendly customer service. If you have any questions about this product by VIW, contact us by completing and submitting the form below. If you are looking for a specif part number, please include it with your message.